You've found the “U.S. Penedesenca Chicken Breeders” page here at Hobby Farm Wisdom! If this is the first time you have visited our site: Welcome! 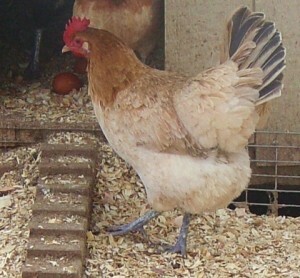 The Penesesenca chicken is a rare breed originating in the Spanish region of Catalonia and is known for the very dark reddish brown eggs produced. Their eggs are said to be one of the darkest of any breed. They also have a unique appearance called “carnation” or “kings” comb, which is a single comb at the front that splits into multiple lobes at the rear, similar to a crown. Like many Mediterranean breeds, these birds are excellent foragers but do not fare as well in colder weather. Their flighty personality is best suited for free ranging since they prefer limited contact and don’t usually do well as pets. There are four varieties of Penesesenca, including crele, partridge, wheaten, and black.